CS Academy is the BEST! 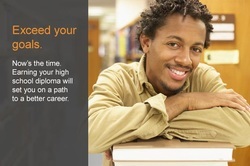 Earning a High School Diploma from CS Academy College Prep can open up new opportunities — start a new career, go to college, earn more money! Our program is convenient and affordable. You study at a time, location, and pace that works for you. As a CS Academy High School student, you are never alone. Expert instructors, and fellow students are just a call or a click away. Get credit for what you have already done. You can receive academic and financial credit for classes you have already taken, so there is no repeating what you have already done. And with CS Academy there is little classroom needed — learn it all at home. If you are interested in attending our online High School, please fill-out the registration form below. Once you have registered, please pay the required enrollment fee. This fee includes taking online courses, and speaking directly with your online educators. As a student you are responsible for your own required text books. Once you have paid the required enrollment fee, please click this link "Class Enrollment" to sign-up for your classes. This program is for adult ages 21-35. This online program is not for High School students currently attending school. Students currently attending High School must go through our regular High School Program.